I’ve been, for the longest time, on the hunt for the perfect fry. Of course, my perception of perfection might differ from yours, which I sincerely respect. However, as with any commendable dish worth writing about, it needs to be, well, addictively delicious, photogenic, quirky, and lest us forget, wholesome. It may be that my oven enjoys playing games with me exclusively at times when I attempt to make oven fries, but I’m more convinced that I’ve been rooted in the mushy side of technique. All of the baked fries, which include up to this point, primarily sweet potatoes and yams, have been tossed in oil prior to baking. Naive as I was, I thought that essentially mimicked the “deep fry” environment: hot oil, in contact with the vegetable’s surface, forcing out the moisture, causing caramelization and dehydration (a.k.a. golden crispness) to occur. It was one thing to be steadfast in a theory. It was another to continuously get roasted sweet potato batons rather than the anticipated crispy fry. 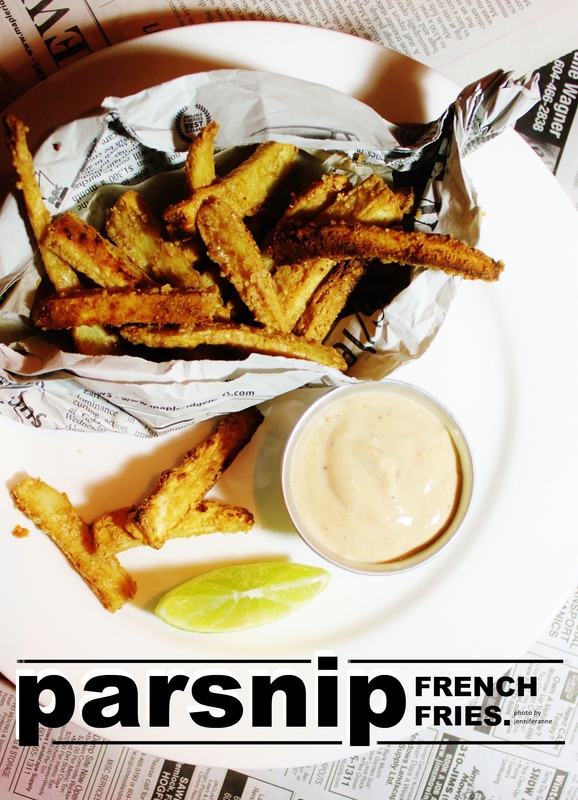 These parsnip fries, I’ll warn you now, are highly addicting. Are there games either NHL or NFL going on this weekend? Make sure you bake up a batch or two of these. No regrets. They are gloriously crispy and golden, with nice deep-fry flavour. A generous sprinkling of himalayan pink salt given right before popping them in the oven gives them a coarseness well balanced by the naturally sweet, buttery, and slightly spicy parsnip. I dipped mine in a vegan chili-lime mayonnaise made without oil. Yes hun, I included the recipe for that too! To make the parsnip fries, preheat the oven to 400 degrees F, with the rack positioned slightly nearer the top. Line a sheet pan with parchment paper. Wash the parsnips thoroughly, scrubbing the skin well as it will not be peeled. Cut the parsnip into thin sticks, like french fries. In a bowl, stir together the peanut butter, oil, and 1/4 tsp salt. Toss the cut-up parsnip in the nut butter mixture until each piece is evenly coated. Spread the fries evenly into the parchment-lined pan in a single layer. Sprinkle with a few rounds of pink salt or more sea salt. Bake for 45 minutes, or until undeniably crispy, fragrant, and golden. Serve immediately, dunking them into a cool, tangy mayonnaise. To make the chili-lime mayonnaise, put all ingredients in a blender and puree until very smooth and creamy. Transfer the mixture into a bowl, cover with plastic wrap, and chill for an hour. This will help all the flavours to marry and be merry. Stir well before serving. I thought the peanut coating, the sweet chili, and lime would go well as they are often used in unison in Thai cooking. The tanginess of the tamarind was definitely relevant, then. Bon appetit! Both recipes are vegan, just FYI. These sound delicious! I never would have thought to use peanut butter, but it sounds really tasty… especially with that chili-lime mayo dip!